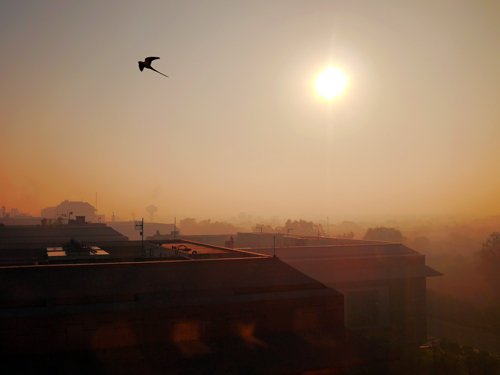 This morning, as I peered out my window overlooking the city, I knew this was going to be a good day. 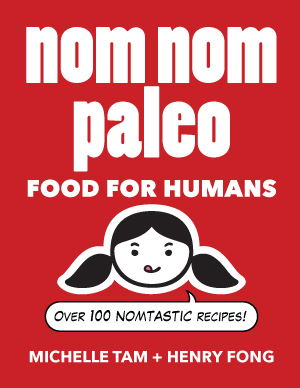 Know why? Because I had plans to go break a sweat at CrossFit Himalaya after work. 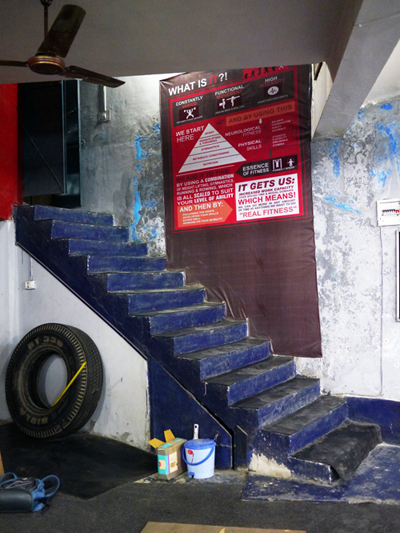 I'd reached out to Piyush Pandey, the head trainer at the box, and arranged for my visit. I'd printed out the address for my driver and asked him to be ready to ferry me through rush hour traffic. It's been five days since my last workout, and I was getting antsy. 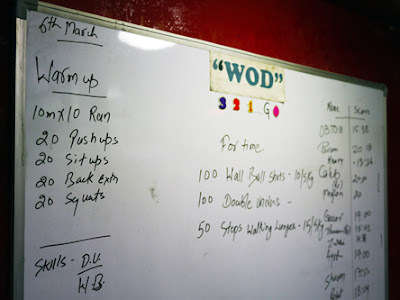 And as luck would have it, my evening workout would, in fact, coincide with the 6 a.m. class at CrossFit Palo Alto half a world away -- the one I'd be attending if I weren't on another continent. Despite my plans, I was thisclose to missing the class tonight. After leaving my office, I had quickly changed into my workout clothes and headed straight for the gym, but the chaotic jumble of cars and buses and pedestrians and bikes and three-wheeled taxis had already choked the dusty roads. By the time we made it to Chatturpur Hills -- just a few miles away! -- it was dark. And my driver was lost. 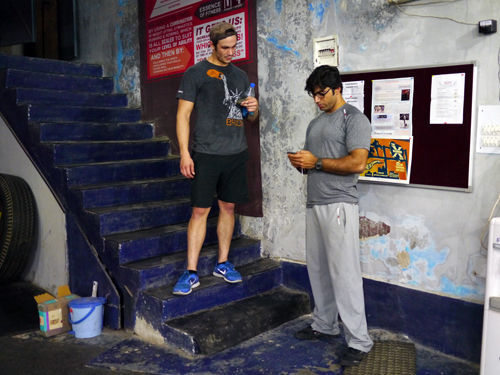 It took another half hour and a couple of phone calls for him (actually me) to locate CrossFit Himalaya. 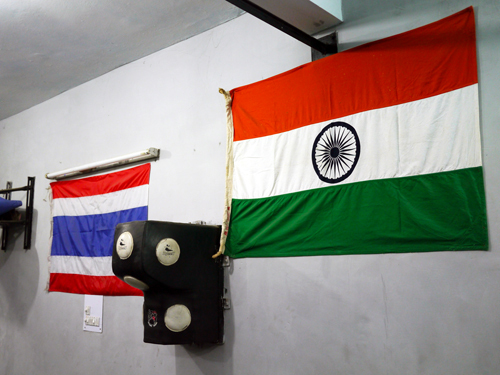 Located down a flight of stairs from a busy stretch of 100 Foot Road, the box is a true basement gym, with equipment that Piyush proudly described as being entirely sourced from right here in India. 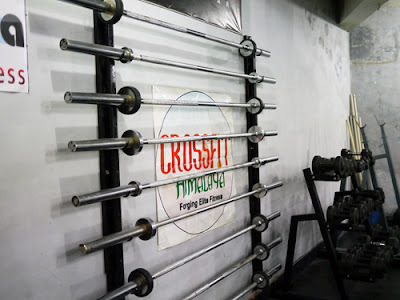 I'm a big fan of all different kinds of CrossFit gyms, but those that strip everything down to the essentials are among my favorite. 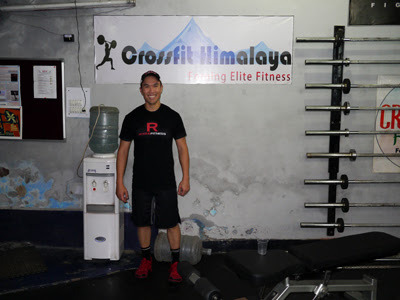 CrossFit Himalaya has a whiteboard, a clock, pull-up bars, barbells and weights, kettlebells and jump ropes -- nothing cutesy, nothing extraneous to the mission of improving fitness. That's right: One hundred wall balls -- two thirds of Karen! -- was just the start of the workout. 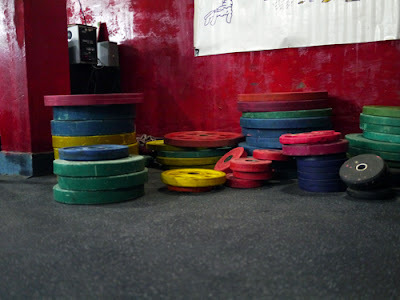 By the time I finished heaving that damned medicine ball up the wall, my legs were fried. With numb legs, I stumbled and tripped my way through the double-unders. It wouldn't be accurate to say that I couldn't feel my legs anymore, though, 'cause I sure felt 'em during the walking lunges. Okay -- so my less-than-blazing time isn't going set any records, but I had a blast anyway. Plus, my goal of sweating buckets was achieved in spades. Can you tell?